During business hours for perimeter protection, EasyGlide warehouse gates are the perfect way to deter daytime access for non-employees, thieves, customers, or truck drivers. Easy Glide dock gates are used as a guide to let anyone know that passing a certain line is unacceptable. These accordion gates are lightweight and typically attached to each side of a dock door opening. These same "Easy Glide" scissor gates can also be installed in business warehouse isles when you need customers to stay clear of temporary forklift activity for safety. The designs from AC Folding Gates offer two key advantages, safety, and durability. SAFETY: Many scissor gates are designed without safety in mind. The collapsing process of other gates can pinch and injure fingers if you aren't mindful. The AC design helps to avoid accidentally pinching fingers with our special no pinch U channel design. DURABILITY: AC gates use high-grade materials and are designed to get twice the operational life of cheaper, unsafe designs. 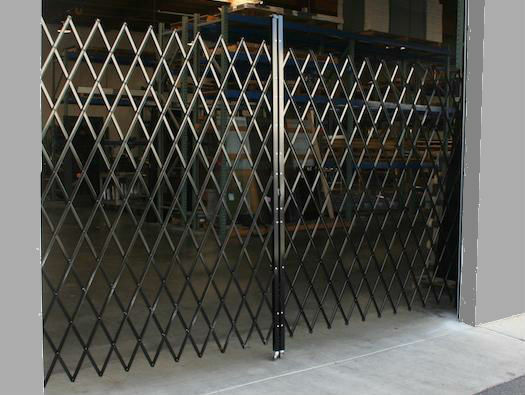 Other brand self-standing warehouse gates can droop sideways after a year or two, providing bad aesthetics and becoming more prone to pinch injury as the gate wears out. AC Gate's special design and quality materials provide many more years of safe operation versus other folding gate designs using cheaper materials, with little attention to operational safety. Buy a folding gate that will last years from AC Folding Gates, the authority in collapsible scissor gates.